If you have eggnog on hand (especially if you made this Homemade Eggnog Recipe), you’ll find that these muffins can be thrown together very quickly. They taste just like Christmas if you ask me! Stir together flour, sucanat, baking powder, salt, and nutmeg. Add melted butter, eggs, eggnog, and extracts. Stir until well combined. Scoop batter into 16 paper lined muffin cups. Bake in a 400° for 15-22 minutes or until muffins are golden brown. Looks great! I make an eggnog coffee cake every year for my hubby. He LOVES eggnog, I however am not a fan. But I don’t mind it in baked goods! I don’t think I can sway from the traditional coffee cake but these would be great to use up the rest of the eggnog for later next week! Yum! I love egg nog. I will have to give these a try! sounds perfect for christmas morning! That sounds tasty. I just bought some eggnog today. Looks like my girls and I have a fun recipe to try tomorrow! Thanks! Wow These would be fantastic! I’m not a big fan of muffins, but the gift certificate sounds good. Oh yeah! These sound so delicious! Where do you find rum extract? Oh my! I LOVE eggnog! So many recipes, not enough time….. I love eggnog muffins. I bet this is a great recipe. I’ll have to try it with the clearance nog at the store or make my own just for this recipe. These look great. I want to try them. Oh yay! Just…yay! Thanks for this! My family will love these! Yum! I am thinking these for Christmas morning instead of the usual cinnamon rolls! Yummy! sounds delicious and would go great with the local egg nog ice cream I just picked up! I bet my husband would love these! He loves egg nog! They sound delicious. I have never used eggnog before. Looks yummy! I guess I will have to make eggnog. You have amazing recipes…as always, thank you for a wonderful job! Merry Christmas! I bet these would be a hit at my house=). I can’t wait to try those out! Right now, there is gingerbread in the oven though! Sounds yummy!!! I may just have to try these. These would definitely be a big hit here! These look so yummy!! :) Thank you for sharing! I know what we’re having on Christmas morning – yum!! Alright…I think I’m going to muster up the courage to make eggnog. All these eggnog posts make me want to give it a whirl! Just finished breakfast, and these were amazing. My kids loved them and want me to make them again. Oh yeah, we used your eggnog recipe, too! 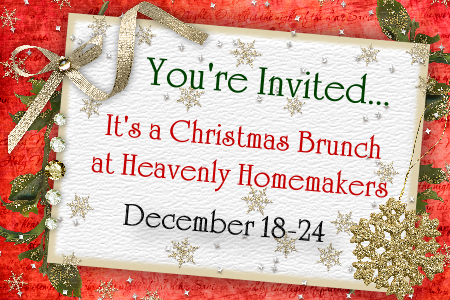 My husband said that it was the best he had ever had…making another batch today. Thanks!!!! I will have to give these a try!! Sound great! Maybe this will be my intro to eggnog. These sound great. Last year I made eggnog cookies which were at hit at our Christmas gathering. I love baking with eggnog since you get the taste of eggnog but it is not as rich as drinking it straight which I can’t do more than 1 glass of. Thanks! I might have to try making some eggnog…at least I know it won’t go to waste with these muffins! Sounds great, going to go make egg nog so we can enjoy tonight and then use the extra for breakfast, yummy! 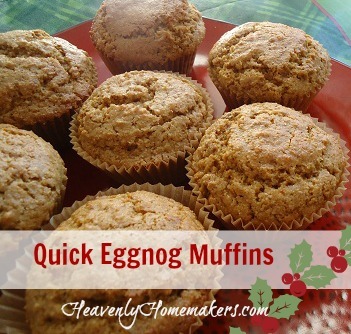 I haven’t tried the eggnog yet, but hopefully I can soon–then I’ll make these muffins! Yum! I wish I had some eggnog left for this. Alas, I used it in eggnog ice cream. These look great! Thank you so much for sharing! I assume you had leftover eggnog. Could I just use milk? Those sound delicious! And I have eggnog in the fridge! Not an eggnog fan but I may need to try these. Thank you. Ohh, I have so much baking to do-but I really think I need to make these as well. They sound wonderful! Another recipe to try – thanks!! Can you say YUM!!! I made an eggnog cake (with yucky stuff that I found on sale a few years ago) and it was awesome. Even my eggnog disliking husband was all about it…I bet this could be converted to a cake and made with some eggnog frosting to make something similar! so having these with Christmas Brunch! These sound good. Thank you for the recipes and the possibilities. This seems good and easy to make. I made cherry eggnog bread yesterday and it is wonderful! So throw in some dried or candied cherries with this recipe! What is sucanat? Is that sugar? I plan on making these! these sound so yummy. I am wondering if I can switch flours to make them gluten free?? These look so so good. Well have to try. I bet these smell sooo delicious! This looks like Christmas Eve breakfast to me! Good thing I hid the eggnog from the boys!! Great way to use up that healthier egg nog recipe! These sound delicious! I add rum extract to my homemade eggnog also- it gives it the perfect flavor! I just made these and we eating them hot out of the oven. They won’t last for long! I had a quart of pumpkin eggnog in the frig, so I used that. Delicious! I just made these for our breakfast in the morning…OH MY GOODNESS. I have already been told I will be making them again!